This is an unoffical impossibles page. HEY EVERYONE. THE IMPOSSIBLES RULE!!!!!!!!! 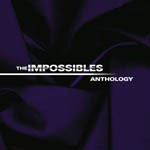 IMPOSSIBLES ARE SKA/PUNK BAND FROM TEXAS. THEY ARE WICKED GOOD. THEY BROKE UP A WHILE AGO. NOW THEY GOT BACK TOGETHER AND ARE MAKIN A NEW CD RETURN. I LOVE ANTHOLOGY, SO I CANT WAIT TO SEE WHAT THEY GOT NOW. IN SOME SONGS THEY REMIND ME OF WEEZER (THE KINGS OF NERD ROCK). WEEZER IS A COOL BAND TOO. BASICALLY WHAT I AM SAYING IS THEY RULE. I LOVE THOSE COOL IMPOSSIBLE SHIRTS THEY WEAR I WANT ONE REALLY BAD. THERE IS ANOTHER CD BUT I CANT FIND A PIC OF THE COVER. IT IS THE SELF TITLED ONE. THE NEW CD IS COMING OUT: 6/06/00. THEY FINISHED IN THE STUDIO ON 3/20.